How can I change to a healthy lifestyle? Read our guide. Deciding to make a change in your life is never easy. Breaking old habits and creating healthy ones can be challenging and even discouraging at times. However, it’s not impossible. Whether you are looking for a positive outlook on life, wanting to change your diet and eat nutritious foods or you need a new workout plan, our Ultimate Guide to a Healthy Lifestyle discusses different ways you can find a healthier and happier life. Let us help you find a plan that fits your lifestyle needs. 1 How do I start living a healthy lifestyle? Changing to a healthy lifestyle is a common goal, but where should you actually begin? After deciding you want to make a change, the next step is to believe you can actually do it and come up with a plan. How can I change my unhealthy lifestyle? Identify the bad or unhealthy habits in your life that you want to change. Then, for each habit come up with the reason you want to change. Maybe it’s for your own mental wellbeing or so you can play with your grandkids. Hold yourself accountable for making those changes. Don’t blame others or a lack of time for not being able to change your bad habits. Just like you would hold a loved one accountable if they made a promise, make a promise to yourself. Remove the negative triggers in your life. If social media makes you feel bad about yourself, delete the account. If drinking alcohol makes you crave a cigarette, take a break from alcohol. You probably already know what triggers your bad habits, find a way to avoid those triggers. Believe that you can change. Half the battle in finding success is telling yourself you can do something. Ignore your negative self-talk and replace it with a visualization of you finding success in the changes you want to make. Know that it will take time and you might have setbacks. Changing isn’t easy and there might be days where you fail. Instead of letting that failure win, just continue working hard. Make a plan with goals and take baby steps. Just like you have a schedule you have to follow at work or at home with certain tasks you have to complete. Your new healthy lifestyle should also have tasks and a plan to follow. What are three lifestyle changes you can make to become healthier? Setting healthy goals is one way to come up with a plan on how to kickstart your new healthy lifestyle. Setting goals gives you something to work for and helps keep you motivated to work hard. By setting goals for yourself you give yourself something to focus on. Additionally, goals allow you to measure your progress and see how much you have achieved. When setting your goals, be realistic with yourself. If you want to quit smoking, lose 50 pounds and run a marathon it’s not going to happen overnight, or it might not even happen in a few months or a year. Not reaching those goals might be discouraging and cause you to give up altogether. Instead, start small and focus on one goal at a time to avoid overwhelming yourself. If you want to lose weight, make small goals on how to do it. Such as working out at least three times a week and adding more vegetables to your plate when you want seconds. Keep a journal or track it in your phone to make sure you achieve those small goals weekly. When those goals just become part of your weekly routine add a new small goal such as only eating out twice a week or adding a weight lifting class to your routine. These small goals are easier to achieve and will eventually lead to meeting your main goal. 2 How can I be mentally healthy and happy? When many people think of a healthy lifestyle they immediately think diet and exercise and completely ignore mental health. However, mental health is one of the most important factors in creating a healthy lifestyle. How do you maintain good mental health? The ability to manage your feelings and deal with everyday stresses and difficulties can be challenging. Maintaining good mental health means occasionally putting your own needs first. We can’t take care of others if we don’t take care of our own mind and body. If you are looking for a healthier lifestyle, start with your mental health and make sure you are finding time to relax and do things you enjoy, rewarding yourself for accomplishments and spending time with good people who value you. Seeking professional support and treatment is one way to improve your mental health. There are additional ways you can improve your mental health naturally. How you think about yourself can have a huge impact on how you feel mentally and physically. Negative thoughts can do a lot of harm to your self-confidence and impact those around you as well. Try to practice positive thinking instead of negative reinforcement. Despite what the evil little voice has to say about your appearance, it’s time to replace it with a voice that is loving, reassuring, stronger and most importantly POSITIVE! Finding value in yourself is the key to a happier and healthier you. What does body positivity mean and how do I become confident in my body? Here we share tips on improving your self-esteem and creating a positive body image through positive self-talk and positive self-image techniques. What is a positive body image? One way to practice positive self-talk and make a healthy mental change is to be kind to your body. A positive body image is an acceptance of your body, both the good and maybe the parts you sometimes feel like you want to change. Not only does body positivity inspire confidence, but it also makes you comfortable in your own skin. Dr. Jonathan Shook, sports medicine specialist share his tips for eating healthy and staying active as you get older. 3 How do I start exercising or enhance my current exercise routine? Committing to a new workout routine can be overwhelming, especially if you are new to exercise. However, exercising is one of the best activities to add to a healthy lifestyle. Not only does it improve your physical wellbeing it also improves your mental health at the same time. Just like changing your lifestyle, you should come up with goals and a workout plan you can follow. Start small by something as simple as walking three times a week and gradually add various exercises to your workout routine. Your weekly schedule should include time set aside that you can workout. For example, if you know you have an hour to kill after work before you have to pick up your kids, use 30 minutes of it to do something active. Check your health: If you are not used to being physically active or you are over the age of 45, consult a doctor before starting an exercise routine. Set realistic goals: Begin with easy and achievable goals such as walking three to five times a week and then add to your plan with new goals. Make it a habit: An exercise routine is only a “routine” if you stick to it long term; try to schedule time each week that you will exercise, that way you hold yourself more accountable. What is the best exercise for beginners? It is important to live an active lifestyle at any age. Getting older is inevitable, but we have tips for avoiding injury, getting in shape, and staying active as the years go by. If you are having trouble exercising due to a bone, joint, spine or muscle injury our physical therapists can help you become active again. OrthoIndy Physical Therapy accepts patients without a referral. This allows patients direct access to physical therapists and treatments. 4 How can I eat healthy food every day? Eating healthy is one of the hardest parts of changing your lifestyle to a healthy one. It’s easy to grab fast food or go out to dinner and get your favorite pasta. However, eating healthy is not just about your weight, healthy food provides more energy to your body, improves your overall health and increases productivity. Be realistic: Changing your eating habits is difficult, so take baby steps. Make realistic and attainable goals. If you eat out once a day, try only eating out every other day for a couple weeks. Know that you can still enjoy food: Eating healthy is about learning balance and still allowing yourself to enjoy the food you eat. Follow a healthy eating plan: Those who have a plan find more success in changing their diet to a nutritious one. Reward yourself: After achieving mini goals, reward yourself with something you have been wanting such as a pedicure. If you fail don’t punish yourself: Setbacks will happen but brush it off and get back on track. Don’t let your setback define your future. Plan your meals: Planning your meals ahead of time, making a grocery list and sticking to the plan means less waste. Cook at home and pack your lunch: Cooking at home is typically always cheaper than going out; make all your meals in one day for the week by meal prepping or make one meal at a time and eat all the leftovers before making a new meal, either way, you’ll be saving money. Replace meat with other proteins: Meat is usually the most expensive part of any grocery shopping trip, replacing meats with other proteins such as eggs, seeds or canned fish is a good way to save a few dollars. 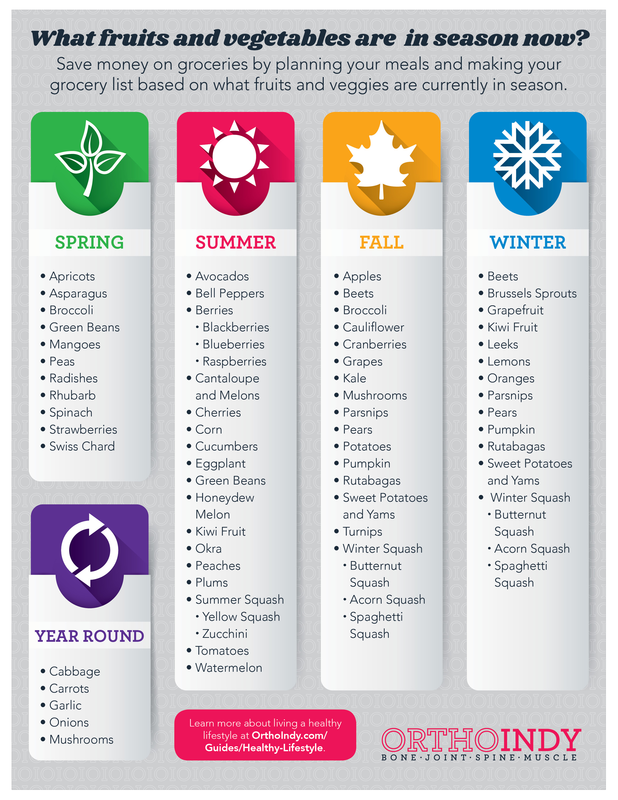 Eat produce that is in season: Buy local produce that is in season and freeze what you don’t use; when they aren’t in season, buy frozen fruits and vegetables. Keep a food diary: Keeping a food diary so you are aware of what you are consuming and the amount of fat or calories in each meal can help keep you on track. MyFitnessPal is the leading resource in nutrition tracking and is free to use. Jessica Moosbrugger, OrthoIndy clinical nutrition manager and dietitian discusses healthy lifestyle changes you can make to lose weight and reach your goals. 5 How can I lose weight or maintain my weight? Whether you are losing weight for health reasons, looking for a new way to lose weight as you age, just had a baby or you simply feel uncomfortable with your body, it can be stressful to come up with a weight loss plan and stick to it. Losing weight depends on one thing---YOU! A weight loss plan needs to be about your schedule, your goals and what you enjoy. Losing weight naturally requires you to kick your old bad habits to the curb and find new healthy habits you can sustain the rest of your life. Eating healthy to lose weight is all about finding nutritious foods you enjoy that you can include in your diet for the rest of your life. There are a lot of diet plans out there that might work for you such as paleo or keto diets, but eating healthy comes down to reducing your calories and including healthy foods like fruits, vegetables, whole grains, low-fat dairy, lean meats, seafood, beans and nuts in your meals. Try to cut as much processed foods from your diet and look for whole foods instead. This doesn’t mean cutting everything you enjoy from your diet, it’s about balance. Although there are a million weight loss plans that promise to have you shedding pounds while you sleep, the reality is that if you want to lose weight, it will take time, just like it took time to put the weight on. The sooner you take the pressure off of losing a bunch of weight in a short amount of time, the sooner you’ll feel less overwhelmed with creating a weight loss plan that you can sustain. Losing weight is not easy. We share tips on how to exercise and lose weight, how to lose belly fat and ways to lose weight without dieting. If you want to lose weight, try to do at least 200 minutes (more than three hours) a week of moderate intensity exercise. However, If you’re new to the exercise bandwagon start with 50 minutes of exercise a week and work up to 200. Exercising to lose weight, just like eating healthy to lose weight really only comes down to finding something healthy you enjoy and will continue to do. Just like with eating healthy, you’ll want to start small and try new activities that will help you stay active. If you don’t enjoy running, don’t do it. Find something that you look forward to doing after a long or busy day. Maybe that’s a cycle class, an at-home workout, a long walk with a friend or a yoga class. The important thing is that you are moving and physically using your body. In the end, losing weight comes down to being mentally healthy, exercising and being mindful of the foods you are putting in your body. Do you want to get active and change your lifestyle but your body isn’t cooperating? With years of experience and the most advanced technology, OrthoIndy physicians or physical therapists will give you the best chance possible to achieve your goals after a bone, joint, spine or muscle injury. Make an appointment and let OrthoIndy’s team of experts help you get normal back, whatever your normal looks like. How do I start eating healthy? With the amount of health advice available online, it's hard to determine where to start when it comes to finding what might work for your lifestyle. Visit our blog for seasonal tips and advice on how to stay healthy throughout the year. Are you are into weighlifting, yoga or running? Maybe you don't know what exercise to try We share tips on anything from the best exercises and recovery to what to eat before and after a workout. Whether it was a sports injury or a knee replacement after arthritis, our patients share their stories about returning to an active lifestyle after surgery or alternative treatment with OrthoIndy. Looking to try new foods? We share what you need to know about new diets such as the keto or paleo diet, how much fiber you should be eating or what to eat to burn fat.